Restaurants reveal some of their best-selling menu items for the home chefs among us. After several months of mouth-watering replications from page to plate, take it from one happy fan, these are first-rate cookbooks. 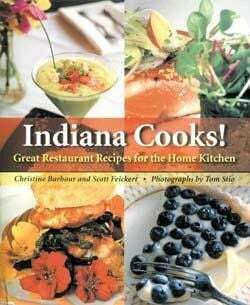 The Indianapolis entries include Dunaway’s Palazzo Ossigeno, Elements, Oakleys Bistro and R bistro. Dunaway’s Dan Dunville prefers to cook “little bites” of food … Tiny course after tiny course comes to the table, none more than a few mouthfuls, and each exquisite, balanced and perfect. Try cooking his seared Ahi tuna, grilled vegetable salad and panna cotta with fresh berries and you’ll come away a believer in small is smart. No bloated, “I can’t believe I ate the whole thing” lament. Greg Hardesty at Elements believes everything on the plate has a purpose. He pairs food and wine. While the book doesn’t give a wine for his salad featuring baby beets, roasted lamb chops with barley risotto and peach tart, I happily sipped a Pinot Noir. Steven Oakley’s crepes recipe is awesome. Regina Mehallick’s butternut squash soup is a must for this fall’s crop and her pear sable with warm caramel sauce is worth the effort. The other entries are equally delicious, all with lush photographs to illustrate presentation. Everybody Loves Pizza is all you ever wanted to know and didn’t know you didn’t know about pizza in this chock-full overview of the one-dish wonder. As to its origin, would you believe the Persian Empire 521 B.C.E.? Get a slice of “seven memorable pizza moments in movies,” and a serving of great pizza Web sites and kids’ books about pizza. It’s a toss-up (pun intended) among great pizza chefs as to what makes for regional tastes. The skinny on authentic pizza at home is pared to realities of cookware in the ordinary house. The recipes are do-able. For when you travel, there’s a listing of the top 10 and 546 other notable pizza places in the 50 states.